Former Nevada City native Bruce Crane has been appointed by Gov. Jerry Brown as CAL FIRE’s chief legal counsel and sworn in with his parents and many CAL FIRE employees in attendance. Crane began his career at CAL FIRE (then known as CDF) in 1979 as a seasonal firefighter. He joined the legal office in 2000 at a time when the department had only three attorneys. Crane’s superiors say that his experience as a firefighter has been instrumental in his ability to understand and provide counsel on issues unique to the department. He will lead a group of 13 attorneys who oversee and engage in a broad spectrum of complex program and policy issues. 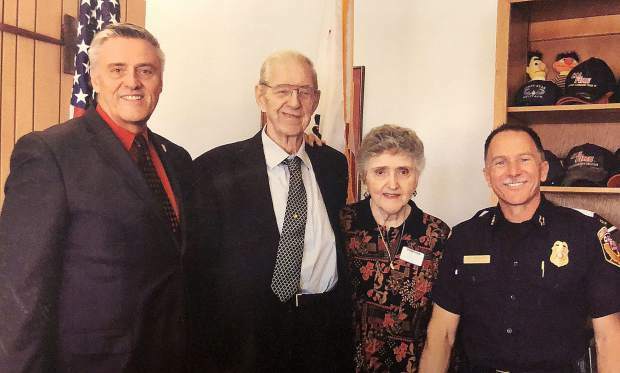 Pictured from left are Bruce Crane, Terry Crane, Mary Crane and Chief Ken Pimlott, director of CAL FIRE.